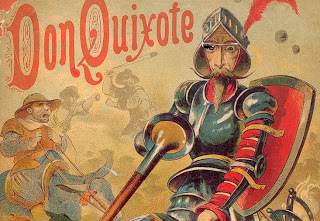 Once upon a Don Quixote who read countless chivalric novels, got immersed in the fictive stories, and started to live them true. He got carried away by the new media of his time. After that era, practically every new media form or technology has had its critics, been deemed suspicious or even malicious: newspapers, radio, movies, tv, computer games, the internet. Yet, they've been happily adopted by the masses. Fiction and entertainment have a mission to tickle our imagination and to carry us away. First the audiovisual technology, and now augmented reality not only glues our imagination, but also swallows up our senses, the perception of our corporeal environment around us. Science fiction is eager to ask us what the real world is like – and what does it matter if we take our daily dose of soma. If one feels it a nice place to live in, and if one has the feeling of control, does it matter what's the boring truth? So, if it were not for the bad of Sancho Panza and of his horse Rosinante, should one leave these self-made knights to live their dreams? Should we let Patrick hover on the living room floor and use his might when dating Daphne? For now, the author stretches his back and pauses. Level 1 finished. Doesn’t this assume a divide between ‘reality’ and ‘data’, something that the Sight film seems to rely on as well? Don’t our human senses simply provide us with ‘data’ about the world anyway – meaning our engagement with the world is always mediated?